I usually start by telling you what’s going on with Wholetones, but today, I want to start by asking you … how you are doing? Are you more peaceful, rested, and sleeping better? Do you look forward to reading my weekly emails? Do you find them encouraging? No, this isn’t a game of “twenty questions.” You see, I created Wholetoneswith one purpose... to help people live lifeto the fullest, and in doing so, change the world! Bottom line, if you are reading this email, you thought enough of me to not only try Wholetones, but to have shared it with your family and friends … and I can’t thank you enough! But I have just one more question before I unpack this week’s musing. Have you noticed when you play Wholetonesin your house, that no matter where you are in the house, even if you can’t hear the music, you can still hear the frequencies? So far, this has been the case with all the Wholetonians I have heard from! This week, I had an unforgettable experience. You see, unbeknownst to me, a friend of mine was in Chicago visiting the new WNDR arts and science museum. As he was walking through the museum, he stumbled upon an exhibit that caused him to text me immediately. 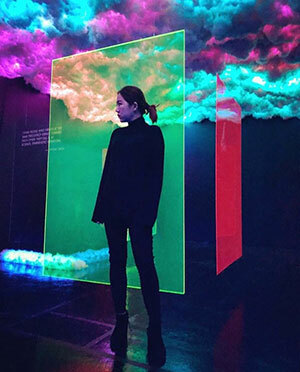 The exhibit was titled: “The Eternal Frequency” and is located in “The Cloud Room.” The exhibit houses 6 quotes from people like Nikola Tesla and Albert Einstein. Now here’s what blew my mind. My friend said, “I was reading another quote that moved me deeply, and I looked at the author's name and it was you!! 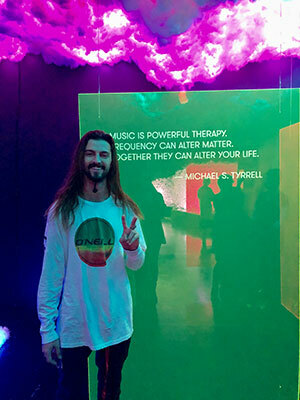 !” The exact quote was “Music Is Powerful Therapy, Frequency Can Alter Matter, Together, They Can Alter Your Life.” - Michael S. Tyrrell. The honor of being part of an exhibit centered around frequency touched me beyond words. Although my research has encompassed over a third of my life, Wholetoneswas just launched four years ago on October 24! There is something unspeakably wonderful about creating something that has no shelf life. Even though Wholetonesis only four years old, the frequencies I use have been here forever! Sometimes in life, although you search for something for years, in the end, it actually finds you. Wholetoneshas indeed changed my life, and I am elated that many of you have shared that same experience. He went on to say, “I have known you since 1996, and I can’t explain this, but you have grown just over an inch since I met you.” I know that sounds crazy, impossible, ridiculous … but it’s true! I am not making any claims except this: I had to buy new jeans because my old ones were an inch too short! At first, I thought my wife was drying them on too hot a setting, but later, after my exam, I realized that I actually grew. Why is this happening? Is it better posture, amino acids, or a continuous sonic daily dose of Wholetones? There is so much I don’t understand, why plants grow like crazy when you put them near speakers when Wholetonesis playing, or set them in front of the television when Chroma is on? Why our nervous little furry friends totally relax when they hear 396hz, The Open Door? Why people sleep better when they play, Wholetones 2Sleep? Not to mention the thousands of testimonials from people like you, who have experienced some type of improvement by simply listening to Wholetones. For me, questions aren’t frustrating. They are exhilarating opportunities that nudge me toward a breakthrough! Remember... everything is frequency, everything possesses a resonant frequency, frequencies alter matter, and frequencies are eternal! The best part is, all positive frequencies have their origin in God. God spoke (audible frequency) and light (visual frequency) appeared! Words, as well as light, are frequencies, and the genus (and genius) of creation originated from God. Thus, God gets the glory for every good and perfect gift, most importantly, eternal life.